As a family, we love getting behind causes. We feel incredibly grateful to have had the opportunity to work together on a project that brings together two of our greatest passions, art for me and Wolves for Chris, whilst also giving us the chance to make a difference to the lives of others in the process. We created Sports Personalities in support of a big fundraising ambition. The first project, comprising the auction and the raffle, has drawn on the unique talents of our team; that’s Andrew Stewart’s brand, strategy and design expertise, Chris’s relationship-driven approach and my skills with a paint brush. I could not have embarked on this journey alone. There is no doubt that together we are stronger. What the three of us at Sports Personalities have in common is a heart to be generous, a desire to bring our very best to everything we do and a passion to positively impact our world. By partnering with like-minded people and organisations, our hope is that we can continue to raise awareness (and significant funds) for good causes through the combination of fine art and sport. 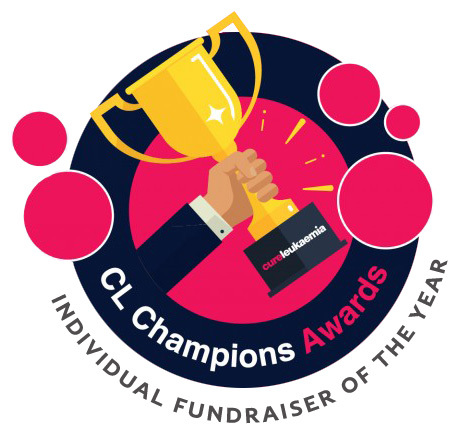 The Cure Leukaemia Family came together on December 20th 2018 for a fantastic afternoon to celebrate an extraordinary year for the charity at their annual CL Champions Awards at Malmaison in Birmingham. At the end of another hugely successful fundraising year for Cure Leukaemia, which has allowed the charity to increase its influence in the fight against blood cancer, a host of awards were distributed on an afternoon when, in truth, all the nominees and supporters were winners. Alongside some incredible fundraisers, Louise was delighted to be awarded the Individual Fundraiser of the Year Award, whom, along with husband Chris and designer Andrew G Stewart, have helped raise almost £20,000 for Cure Leukaemia. Louise’s paintings of Wolves players have been sold through a variety of fundraising auctions, and she has also produced further work to benefit the charity, including a limited edition book and portraits of Beverley Knight and Robert Plant. Louise was always going to paint. She was literally born with a paint brush in her hand! For over 10 years she inspired students in the classroom, sharing her alchemy and contagious passion for creating and painting. In 2015, Louise took a leap of faith; she called time on her teaching career and set up as an independent artist and illustrator. Early success and feedback suggested that she made the right decision. Shortly after painting husband Chris’s favourite footballer Rúben Neves in February 2018 her world changed forever. Louise now creates the matchday programme cover artwork for Wolverhampton Wanderers having been commissioned by them for the duration of the 2018/19 season. She’s been commissioned by Premier League footballers and complimented by their mums but still remains grounded and unassuming, never taking herself too seriously and never too precious to receive feedback, even from Chris’s untrained eye (! ), on her paintings. Louise is passionate about making art affordable and accessible. She’s also a big fan of young people, hence her volunteer role with Forge Church Youth. Last but certainly not least, Louise loves to spend time with her family; that’s Chris, Joshua and Amy as well as their beautiful Burmese cat Simba. Chris has three major passions in life: Wolverhampton Wanderers, his faith and his family (but not necessarily in that order). In the early 80’s, Chris was a Wolves mascot at Portman Road (Ipswich Town’s stadium); his son Joshua repeated the tradition by walking out with Joao Moutinho in the 2018/19 Premier League season opener against Everton at Molineux. Chris wears his heart on his sleeve, he places great value on relationships and cares deeply about people. It’s therefore perhaps no surprise that Chris now finds himself approaching 20 years in the world of IT recruitment, matching job seekers to companies and vice versa. Chris is incredibly grateful for the opportunity that Sports Personalities offers to bring together his passion for Wolves, Louise’s passion for art and their mutual passion for making a difference in the lives of others. He has always been Louise’s greatest advocate when it comes to her art and couldn’t be any prouder that she is now producing the programme cover artwork for Wolves in their first season back in the Premier League. Andrew is the third part of Sports Personalities. He’s the invisible force behind the creation of the Sports Personalities' brand, strategy, website and recent book ’Together we are Stronger'. A veteran of the creative industry, Andrew is a black belt designer (also a black belt in the obscure Korean martial art Kuk Sool Won). From the time he bought his first Nikes in 1987 and before a career in the creative industry, he’s been intrigued by the power and influence of design and what he now knows to be the art of branding. Andrew has spent the last 3 decades working with international finance companies, a global energy giant, UK Government on overseas initiatives and more recently, championing causes in the third sector, where the charitable and faith-based organisations dwell. Andrew is passionate about causes and good stories. He loves his fat Labrador dog ‘Popcorn’, a tiny island in the Aegean called Paxos and his family. He lives in the beautiful county of Suffolk with his lovely wife Andrea, son Loui and two cats Hugo and Teddy. Artist Louise Cobbold in her studio adding the final touches to her painting of Wolves Head Coach Nuno. It’s funny how things start, how things come together. Take my husband’s three passions; Wolverhampton Wanderers, his faith and his family (not necessarily in that order!). I’m an artist; I was also an art teacher until a couple of years ago. As a gift for Chris, I recently (in February 2018) painted a picture of his favourite player Rúben Neves. Chris then shared his gift on social media. That’s when things changed – that’s when the idea ignited. That's when we came up with the idea: How about painting a series of original artworks capturing what has been one of the most exciting seasons in Wolves’ recent history? I could sign them as well as the relevant players and we could give them away to Cure Leukaemia for auctioning with all proceeds going to support the amazing work of this charity. Chris and I approached club photographer Sam Bagnall, a long-term supporter of Cure Leukaemia, to run the idea past him and, as they say, the rest is history with Cure Leukaemia and Wolves in full support. Why are we giving 13 original works of art away? As a family, we love getting behind causes. We feel incredibly grateful to have the opportunity to work together on a project that brings together two of our greatest passions, art for me and Wolves for Chris, whilst also giving us the chance to make a difference to the lives of others in the process. Twelve was the original plan. We decided to offer a thirteenth though, via a raffle, as we wanted all Wolves’ fans, irrespective of financial circumstances, to have the opportunity to own an original. The Neves painting was the natural choice as this was the image that sparked the social media reaction that ignited this whole idea. Beyond the raffle & Great Big Art Auction: There seems to be so much potential in this blended approach, giving away a high proportion of original paintings to raise money for good causes whilst making art accessible to fans via Limited Edition prints. The next step could be a collection capturing Wolves’ first season back in the Premier League or perhaps even a Wolves’ legends’ series. Who knows? What we can say though, is that we are loving this exciting new adventure and are so grateful to Sam Bagnall, to Wolves and Cure Leukaemia for making this possible and to fans across social media for their continued encouragement and support on this journey. We hope that this is just the beginning.